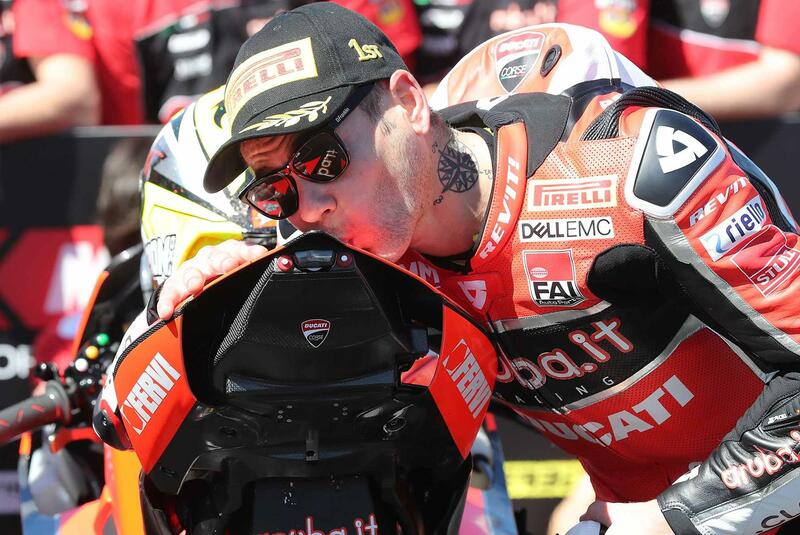 World Superbike rookie Alvaro Bautista has dominated the opening race of the 2019 season in Australia, finishing just shy of 15 seconds ahead of four-time champion Jonathan Rea. The win makes the Aruba.IT Racing Ducati rider the first rookie to win on their debut since Max Biaggi in 2007 aboard a Suzuki GSX-R1000 and highlights the Spanish rider as one to watch over the coming races. Bautista was able to take the lead on the third corner aboard his Ducati Panigale V4 R and start to build a gap, after the Kawasaki pairing of Leon Haslam and Rea were able to get a good start into turns one and two. From there, Bautista was able to set a succession of fastest laps and had bolstered a lead of over eight seconds by mid race distance. This then left a gaggle of riders locked in a battle for the final two spots on the rostrum. Finishing 14.983 seconds down on the winner was Rea, with Marco Melandri rounding out the podium for the newly-established GRT Yamaha team, after a late race charge saw him climb up the positions. He was the first of three Yamahas across the line, with Alex Lowes and Michael van der Mark finishing in fourth and fifth respectively. 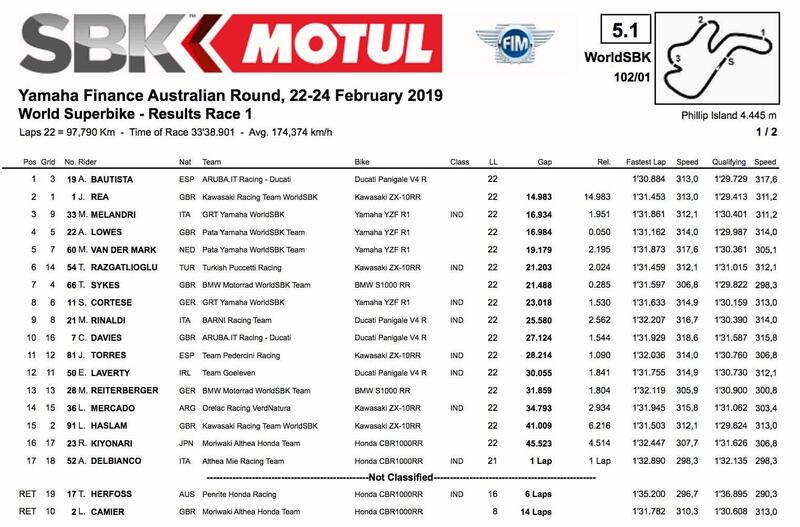 Championship rookie and 2018 World Supersport champion Sandro Cortese crossed the line on the second GRT machine in eighth place behind the BMW of Tom Sykes and Puccetti Racing’s Toprak Razgatlioglu. After a strong start and a closely contended battle for second position, Haslam was able to break away from Rea, before crashing out at turn four. He was able to remount his ZX-10RR machine and eventually cross the line in 15th place. Other fallers also included fellow Brit, Leon Camier, who crashed out on his Moriwaki Althea Honda after eight laps. His teammate, Ryuichi Kiyonari, ended the race in 16th place behind Haslam, 45.523 seconds down on the winner.